and more. Waterproof and durable use them outdoors and indoors. Indoor Banners are great for POP displays, artful decor, indoor banners and more. The material has a smooth matte finish which offers high print quality and versatility. It is not waterproof or scuff resistant. alternative to our normal retractable stands. 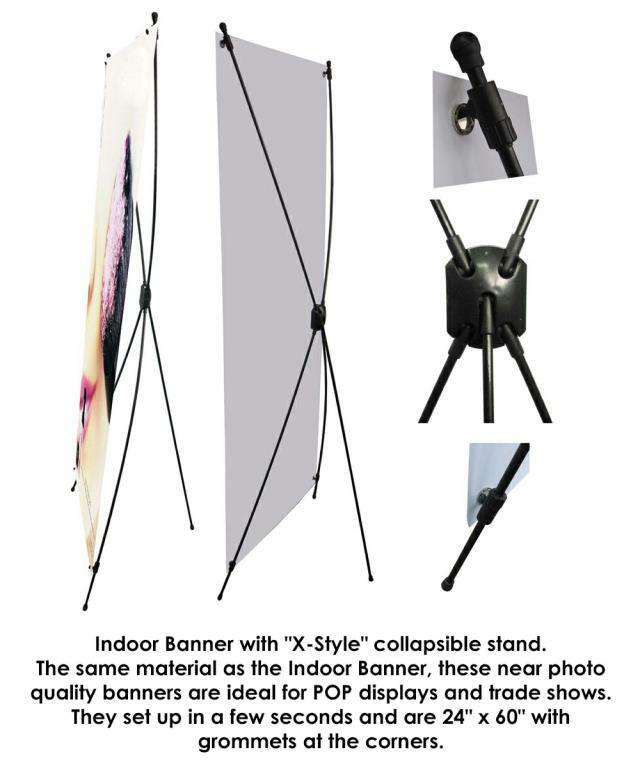 Our Economy "X-Style" Collapsible Banner Stands are versatile and easy to setup. They are available with either our 13 oz scrim vinyl outdoor or 10 mil premium vinyl indoor banners and arrive in a slim nylon bag. PREMIUM, 59.5" x 150' + 10 mil thickness. 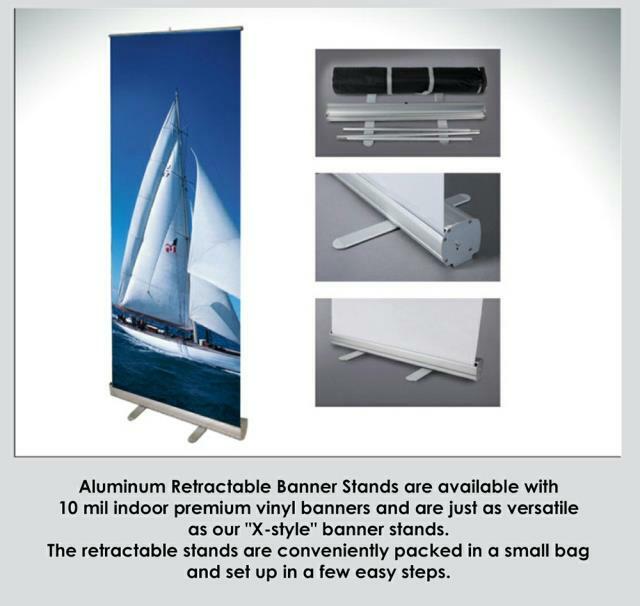 Aluminum Retractable Banner Stands are available with our 10mil Premium Vinyl Indoor Banners. Great for POP displays that quickly and conveniently showcase your products and services. 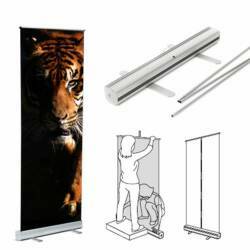 The retractable banner stands are conveniently packed in a small pouch and sets up in a few easy steps. The banner size is 33" x 80". We require a bleed for this banner stand product - 33" x 80" should be 34" x 81" - this product does not require grommets. We suggest that you use our template available in our Grand4mat templates section, to ensure you are within the safe zone. Bleed: 0.5" bleed on all sides, no crops - make your artwork exactly 34" x 81" to be cut down to 33" x 80". these are a more stylish alternative to our normal retractable stands. A bigger, heavier base with chrome accents make it stand out. Available with 10 mil indoor vinyl. 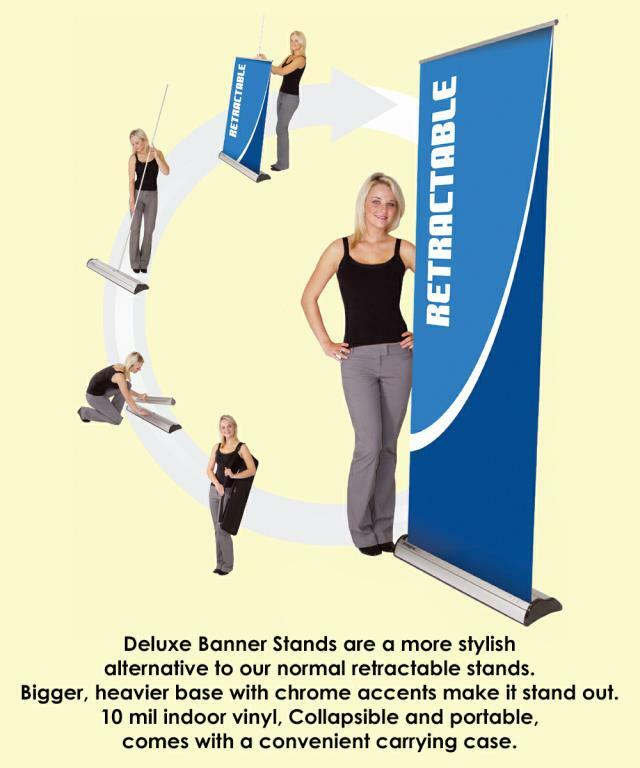 Collapsible and portable, each banner stand comes with a convenient carrying case. Bleed: 0.5" bleed on all sides, no crops - make your artwork exactly 34" x 81" to be cut down to 33" x 80"
X-Style Banner Stands are available with either our 10mil Premium Vinyl Indoor Banner, or our 13oz Scrim Vinyl Outdoor Banner. The banner size is 24" x 60". We require a bleed for this banner stand product – 24" x 60" should be 25" x 61". 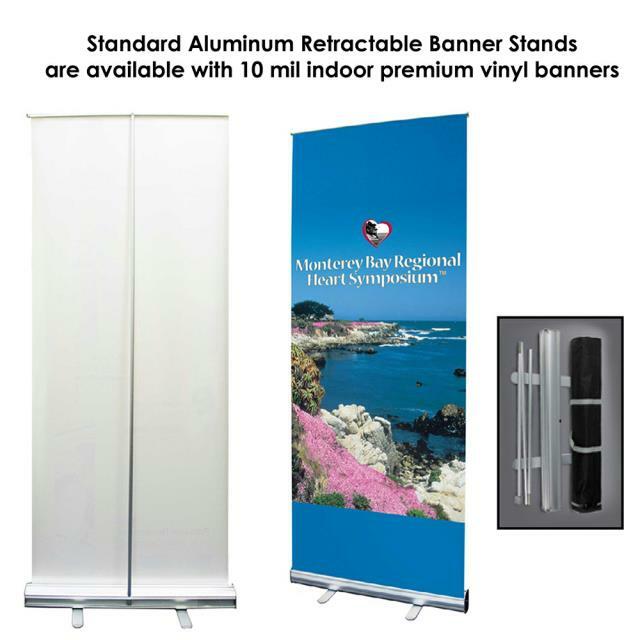 Purpose: The 10mil Premium Vinyl Indoor Banners are near photo quality and are ideal for trade shows and POP displays. 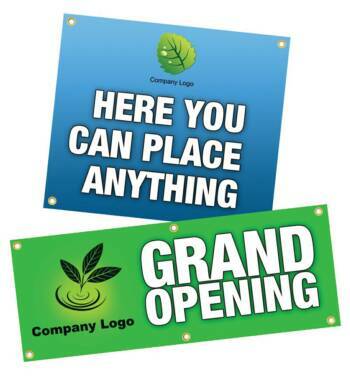 The 13oz Scrim Vinyl Outdoor Banners are more durable and waterproof and are great for POP displays as well. These stands can be set up in seconds and the banners have grommets in each corner.